RewardSurvey.com represents a dynamic approach to surveys that yields actionable results. RewardSurvey.com uses incentives to increase the response to yield a more robust portrait of opinion and experience without prejudicing answers. They provide implicit reports that make results crystal clear, providing more value to the businesses that are seeking information about consumers. Short surveys with precisely worded questions and a multitude of response formats enable RewardSurvey.com to cycle respondents through at a very high completion rate and get to the heart of what companies need to know about their customers. Complete short surveys waiting for you at RewardSurvey.com, where they truly value your opinion. Spend your rewards on valuable prizes today or bank them for even bigger prizes. 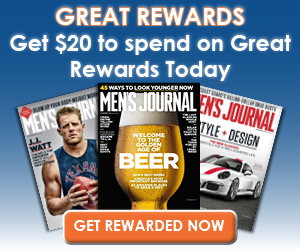 New magazines are added to the rewards options all the time, including Men's Journal. Written for adventurous men, Men's Journal describes its readers as interested in outdoor experiences, health and fitness, style and fashion, and cutting-edge gear. Get inspired to "Live the Adventurous Life" and read about other men who are doing the same. Editors hand-pick the most stylish and current attire for your wardrobe, feature the equipment and accessories you'll need for all adventures, and share ways to stay in shape during the cold winter months and hot summer sweats. Each week, you can complete a survey and receive a $20 credit valid for the magazine subscription of your choice. Check back each week for new surveys and new rewards. You can also refer 5 friends and just by entering their email addresses you'll receive $15 in free rewards points. Right now, complete a short survey about salad dressing and receive a $20 credit redeemable for a Men's Journal subscription. Hurry, they're available on a first come, first serve basis.